How can I fix my model’s MMD hair physics? How do I use PMDE to adjust my model’s physics? How do I fix MMD hair physics? Hi, hey hello everybody! I’m a new member of the LearnMMD team named oomary! My specialty is in physics and making them as smooth as possible and not floppy (like the usual MMD physics!). A little disclaimer: Depending on what you’re going for, your physic settings will be different from the ones I recommend in this tutorial. Also do note, you should probably apply the learnings of LearnMMD’s other basic physics tutorials, then use this tutorial for things like tuning the hair physics. This video demonstrates the MMD hair physics I create using the concepts I show you in this tutorial. The body and joint settings of your physics are what make them look smooth and flowing. Most physic tutorials will tell you “put these numbers in and you’re good”, but what’s any use in knowing the numbers if you have no idea what you’re typing in? Let’s go tab by tab in both the body and joints tabs, but before we do that, let’s go over something very important. B. a much smoother way to weigh hair. A: pro tip: Correctly parent and position bones. 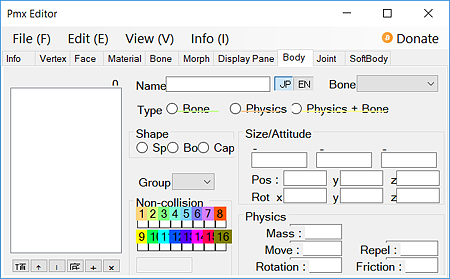 Let’s say I have hairbone1, and hairboneend… I parent hairbone1 to the head, and hairboneend to hairbone1, then select both bones, go to edit, bone, and create middle bone. Do this several times, parent and connect them all together, and you should have a nice balanced set of bones. The part your looking for can be found about 4:30 into the video. With those tips out of the way, let’s begin the main part of the tutorial! Going from top to bottom, let’s start with SHAPE: Shape is almost always irrelevant to actual physics, just set them to cap (which is a pill shaped looking physic) and you should be basically fine). The SIZE of your physic bodies will determine how good the collision physics on your MMD model are. Good physic edits will have bigger sizes going down on the model, as most hair meshes are thin at the top, slowly getting bigger down at the bottom. Position and Rotation shouldn’t be messed with, as they both simply mean where your body is on the hair, and you don’t have to change that, and if you do need to change it, you should do it from the PMX view window. Next up, we have the important part: physics. I’ll start by explaining mass, and go on from there. The simple explanation of what hair mass is, would be: weight. it’s how much your hair physics weigh. Set this to something like 1000, and your hair won’t move, because it’s too heavy. Set it something like 1, and it’ll swing and go absolutely insane! You also won’t want the same settings on every physic body. This isn’t exactly what you may have, but it’s close enough to be good. Next up, your move values. This can be simply explained as how slow or fast your model’s hair moves around, hence the term, move values. That was a short one, but I think this one is even shorter, Your rotation values. This is, relatively similar to move values, it controls how much your hair rotates, or spins around, now this you won’t really have to change much. Your best bet with smooth rotation values, is to set them to something like 0.999999999 (just a hair less than zero) and then at about the last 2 or 3 bodies, set it to 1. This will make the ends of the hair more similar to real physics, moving around less at the bottom, and more in the middle and top. The first row, is similar to the aforementioned move values, it limits how much your hair can move around.This parameter isn’t really needed to be edited for hair physics to be super smooth, though they definitely help with skirt physics (which I end up explaining a few sentences later.) You should usually never use the axial rotation row (the row under the move one), as it usually won’t ever help your physics. The spring rotation and move rows, also usually won’t really need to be messed with. If you change them, it just changes the limits on like, how much your joints can move, and rotate, similar to the row above it. While this is definitely a hair physics tutorial, I know there’s gonna be that one person who goes, but what about skirts? ?the body settings I provided above are most likely not gonna work either your ultra high quality skirt plugin skirt physics, but I can make a separate tutorial on that if you would like. 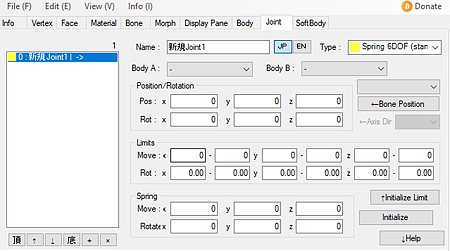 for now though, I can give this one general tip for smoother skirt physics, specifically for dancing motions; in the move parameter llimits row set the first box to -1 the second to 1, as shown below. Don’t set these settings on hair physics though, as it’s not necessarily needed, and honestly, while it’s good to know how they works you most likely wont need to do many joint edits when updating your hair physics. If you have all of that done, your physics should be just about good to go! Open up transform view, and test them out! I hope I was able to help you smooth out your physics! Please leave a comment and let me know, and… I’ll see you in my next article! This is awesome! Well done. This will definitely come in handy.